We're helping out a friend in Beijing who is having temporary computer problems. 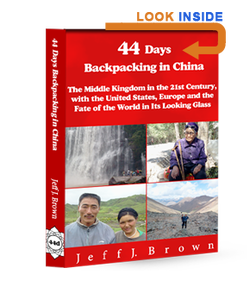 If you'd like to buy a digital copy of his book 44 Days Backpacking in China - which we highly recommend - simply click on one of the links below. You can buy a print version of the book at Amazon. By far the best way to read 44 Days and only available here. All +125 photos, maps and charts are in blazingly beautiful full color. The book is large format, 178mm wide x 254mm tall (7 inches x 10 inches), with two big photos per page. Great on your phone, reader or PC. Otherwise it is the same as the B&W ebook version. Buy the book for yourself or we can send it as an e-gift, with a nice e-dedication and e-signature by Jeff. 44 Days is not tied to your reader or hard drive. You can transfer it between your PC, phone, reader, keep it in your library, or later transfer it to someone else if you choose. Just click on "I Want This" when you arrive at the purchase page. For the budget minded. +125 photos, maps and charts are in B&W, like the print version.The book is large format, 178mm wide x 254mm tall (7 inches x 10 inches), with two big photos per page. Great on your phone, reader or PC.